One needs only to glance out the window to see the undesired effects of the ongoing drought. For folks who live east of the Cascades, the color of even cloudless skies has been transformed into an ominous gray by smoke from numerous raging wildfires. In addition to the thick smoke, blowing dust has occurred on windier days. As a result of the periodically poor air quality, breathing has been difficult for many residents, and even dangerous for sensitive individuals. The smoke and dust have also significantly reduced visibility at times, which led to the closure of Interstate 90 near George on August 14th. Sadly, the wildfires claimed three lives recently, while threatening countless structures across the state. No rain has fallen at Prosser in almost three months, and prospects are less than promising for the coming days. 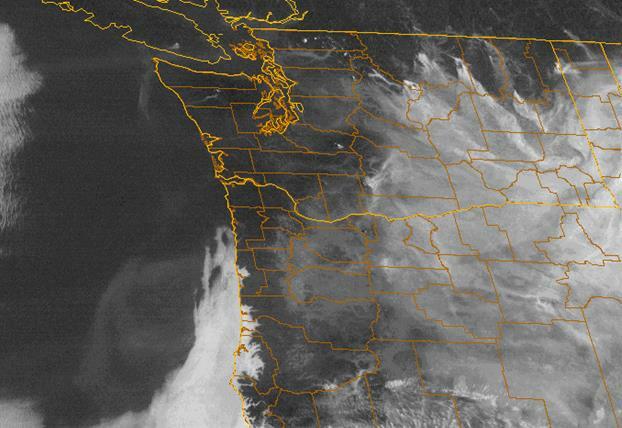 Figure 1 is a visible satellite image of Washington from August 19 which shows multiple smoke plumes emanating from wildfires in north central parts of the state, as well as near Mt. Adams. Despite the almost total absence of clouds, smoke is clearly present across most of central and eastern Washington and beyond. Something unusual happened in late July and again in mid August in parts of western Washington - rainfall. The welcome water was much appreciated but hardly made an impact on the long term drought situation. Seattle received 1.79 inches of rainfall on August 14th, although much of the state missed out on the pennies from heaven. Along with the spotty rainfall, cooler temperatures also made brief appearances in recent weeks. July 26th was Prosser's most below normal temperature day since January 2nd. Although the recent weather has been less extreme than June and early July, we have nonetheless largely tilted toward hot and dry conditions since mid July. In fact, July 2015 was the hottest month on record at Mt. Vernon. In a broad sense, 2015 has been an amazing year in which Prosser's warmer than normal days (by 5 or more degrees) have outnumbered their cooler than normal counterparts by more than 10 to 1. Figure 2 shows the sea surface temperature (SST) anomalies for August 17. The water across most of the eastern two-thirds of the (northern hemisphere) Pacific Basin is warmer than normal, as indicated by the orange/red colors. Since this represents the source region of most of the air masses that traverse our state, generally warmer than normal conditions are likely for the Northwest in the coming months. Unfortunately, water has a much larger heat capacity (resistance to temperature changes) than air, which means that ocean water would cool more slowly than the atmosphere. Perhaps more importantly, the indirect effect of the atmospheric circulation changes associated with the warm ocean will likely cause a ridge of high pressure to persist over the Northwestern US for the foreseeable future. The red colors (abnormally warm water) near the equatorial Pacific are associated with strong El Niño conditions, while the red colors off the west coast of North American are described as a positive PDO (Pacific Decadal Oscillation) pattern, and have also been characterized as 'The Blob' by some reports. Interestingly, the warm area of the eastern Pacific Ocean is now so expansive that these erstwhile separate regions are expanding and merging together to create one massive warm region west of the Americas. Rarely if ever have all of the available climate signals pointed so uniformly and unwaveringly in one direction as they do this year. Unfortunately, that direction happens to be toward very un-winter like weather for the coming winter season. As has been the case for most of the growing season so far, the overall drought outlook remains largely unchanged, and perhaps slightly worse relative to the previous writing. Nearly all climate indicators, including various dynamical and statistical models, continue to suggest enhanced odds of warmer and somewhat drier than normal conditions through mid 2016. Recent observations indicate a strong El Niño. 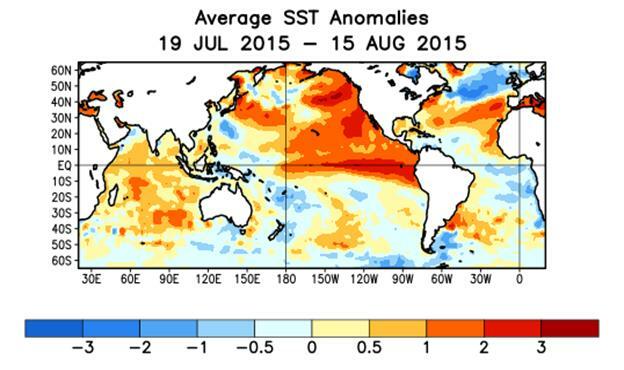 In fact, only once since 1982 has El Niño been stronger in July than it was last month. Forecasts suggest a high likelihood (85+%) of El Niño persisting through next spring. With a strong El Niño likely here to stay for a while, the main question is whether this event will be the strongest on record (since 1950). Following a brief downturn, the Pacific Decadal Oscillation (PDO) index has increased over the last two months, and its July reading was the highest for that month since 1997. According to the Climate Prediction Center, warmer (Figure 3; red color over Washington) and drier (Figure 4; brown color over Washington) than normal conditions are likely in Washington this winter. As is always the case, we encourage folks to check in with AgWeatherNet for weather/climate and decision aid information. AgWeatherNet's irrigation scheduler allows for the efficient utilization of water resources, such that enough water is supplied to maintain the health of the crop without wasting water. Also, our Growing Degree Day (GDD) calculator shows how accumulated heat units are progressing this year relative to previous years. Please contact Nic Loyd, Meteorologist, 509-786-9357 or	Gerrit Hoogenboom, Director, 509-786-9371 for further information or inquiries regarding the current status of Washington climate.